April showers may bring May flowers, but they also bring wild and crazy busy days for families like mine. Also, I might add, a lot of extra expenses with end-of-school teacher gifts, upcoming vacation plans, graduation gifts, etc. Just this morning I was telling myself, “No eating out for the rest of the month!” We’ve gotta save dollars wherever we can. Does this sound familiar? Fortunately, we are working on the 52 Week Savings Plan. Are you? What I love about May is that the world seems to come alive this month – flowers bloom, gardens are planted, seniors graduate, mothers are celebrated and the wedding season begins. The month ends with Memorial Day weekend, ushering in summer. May is also National Physical Fitness and Sports Month and National Bike Month. Hot dogs — These freeze well. Condiments (ketchup, mustard, barbecue sauce, relish) — All have a long shelf life. Bottled water — Stock up on several cases. They have a long shelf life and can become part of your water storage. Mushrooms — These can be dehydrated. Cheese — Most cheeses freeze well. Watermelon — Believe it or not, this can be dehydrated. Salsa — Long shelf life. Tortillas — Easy to freeze these. I recommend using a Food Saver vacuum system to avoid freezer burn. Refried beans — Canned goods have a long shelf life that extends beyond the date stamped on the can. Baked beans — Stock up for summer picnics and holidays. Frozen Mexican food– and many other food items associated with those two holidays. There will be deals before and after as stores compete to get people to buy supplies at their stores. Look at weekly ads for loss leaders. Chocolate and food sets for Mother’s Day should be discounted after the big day is over. Chocolate can be stored in canning jars, along with an oxygen absorber, for longest shelf life. You can also use a vacuum sealer, such as a Food Saver, to vacuum the oxygen out of the jar. If you can handle having chocolate treats around the house (I can’t! ), buy a few and set them aside as teacher/coach gifts for the last week of school. By the way, if you have active kids who will be burning calories like crazy, stock up on fresh tropical fruits like papaya, pineapple, and mango. The sugars in these fruits hit the digestive system most quickly and are most effective with recovery. If you haven’t yet learned how to dehydrate your own fruit and veggies, this is the year to do it! It’s so very easy, easier than canning, and there is just one big expense up front — the dehydrator itself. Although the Excalibur is considered to be the best, I have an old Nesco machine I bought on Craigslist 8 years ago and it’s still going strong! You can read more of my tips for dehydrating food at this link. Party supplies like disposable cups, plates, napkins, utensils and table clothes will go on sale after Memorial Day. These are great to stock up on any emergency – small or big – or any future parties. Graduation party supplies will also go on sale and can be stocked up on for any future graduation celebrations. Look to stock up on solid colors of these paper goods so they can be used for other holidays and celebrations. As well, patriotic patterns can be used for Memorial Day and Independence Day. Mother’s Day gift sets, such as spa supplies, fragrances, jewelry, crafts, candles and photo frames, will go on sale after Mother’s Days. These can be stocked up on for future gifts like birthdays and Christmas (less than 9 months away!). Late-May is the start of wedding season, and this leads to some excellent discounts you can take advantage of, even if you aren’t a bride! Watch for discounts on household products like coffee pots, cookware, vacuums, massage chairs, foot spas and other small household electronics. If you have a favorite electronic that goes on sale, it might be a good idea to get a backup for when your dies or breaks. All of these items make great gifts for birthdays, Father’s Day, and Christmas. Also, in many parts of the country, October is another big wedding month, so you might want to buy a great gift now to give to the lucky couple later. There may still be some winter items on deep clearance, such as linens, shoes, boots, jackets, coats, and clothing. Spring clothing will start to go on sale as the summer items come out. Spring clothing can be lightweight jackets, rain gear, and long-sleeve shirts, which are both very smart items to keep in an emergency kit since they are useful year-round. You’ll also find sales on umbrellas and rain boots. May is also the time for new mattress models to come out, so older ones go on sale. Preppers underestimate the importance of getting enough sleep. If you’re exhausted and unable to focus, you’ll have a hard time dealing with emergencies. Experts say to replace your mattress every 7 years. Be sure to shop around and compare, though, as mattresses are known to have one of the highest markups in the home goods industry. Discounts can be found on pet supplies, cordless phones, and refrigerators, too. Look around the house and check your inventory to see if any of these discounts can help you get better prepared for any emergency. If you’re a beginner at gardening and not sure exactly what tools you need, I have a list here to help you decide. Look for sale prices on Amazon as well as in big box stores and local mom-and-pop nurseries. Grilling is a great way to cook when you lose power. Grilling supplies such as charcoal, lighter fluid, utensils, and grills should be on sale this month. These supplies are also great for providing a backup method for cooking food if the power goes out. Insect repellant, sunscreen, and sun hats should be on sale in May, along with outdoor furniture. Sunscreen is a good thing to have in a bug-out bag any time of the year. Beach toys should be on sale, which can be used to keep children entertained outside or bought for future gifts. Athletic apparel and shoes should be on sale as people start getting re-inspired to work out with the nice weather. The emphasis on fitness will last all month with May being National Physical Fitness and Sports Month. Gyms and fitness facilities may offer free classes or trial memberships. Keep an eye out for bicycle workshops and activities for National Bike Month. Local groups may hold bike rodeos for children to check helmets and teach bicycle safety. Bicycles and accessories may even be on sale in some stores. Bicycles can be a good way for a family to bug out when vehicles are not usable. With this in mind, several years ago I saved up enough money to buy each family member a high-quality, very sturdy bike. We’ve gotten a lot of use out of them and I’m confident that even I, the least fit member of my family, could ride up to 40 or 50 miles in a day. Another related item to watch for is a heavy-duty trailer to hold your gear and supplies, just in case you ever have to bug out on a bike. Camping and outdoor gear should be on sale this month as people gear up to get ready for camping season. Some people plan to camp during Memorial Day weekend to kick off the summer. Camping gear is useful for bug out bags and for tornado shelters. Having a camping mattress to sit on in a basement during a tornado watch can make life a little more comfortable. If there is going to be severe weather during the night, it might be a good idea to have your family “camp out” in the basement. It’s always a good idea to test out camping gear before having to depend on it for living with it for good. Flea markets and yard sales gear up this month as people have been spring cleaning or are preparing to move. Here’s a list of 21 things to always be on the lookout for at yard sales. Some stores don’t announce free activities or giveaways until right before the event. Keep an ear out if any stores around you will celebrate hoagie day on May 5, beverage day on May 6, apple pie day on May 13 or hamburger day on May 28. Some summer reading programs start in May. Check your local library and local bookstores to see what they offer. For a list of stores, theaters and online programs, visit Free Summer Reading Programs. Several stores also offer children freebies as a reward for a good report card. Ask your local stores if they do anything for report cards or, for a list, visit Good Report Card Freebies. Check local hardware and craft stores for children’s make-and-take events. Register at Kids Bowl Free to get children up to 2 free games of bowling a day at your local bowling alley. Some movie theaters offer discount movies during the summer. Check your local theater for prices and movie listings. By the end of May, you should have $231 saved if you’re following the weekly savings plan (21 weeks). If you have extra right now, perhaps going to a higher week in the chart and putting that money away would be a smart thing to do. 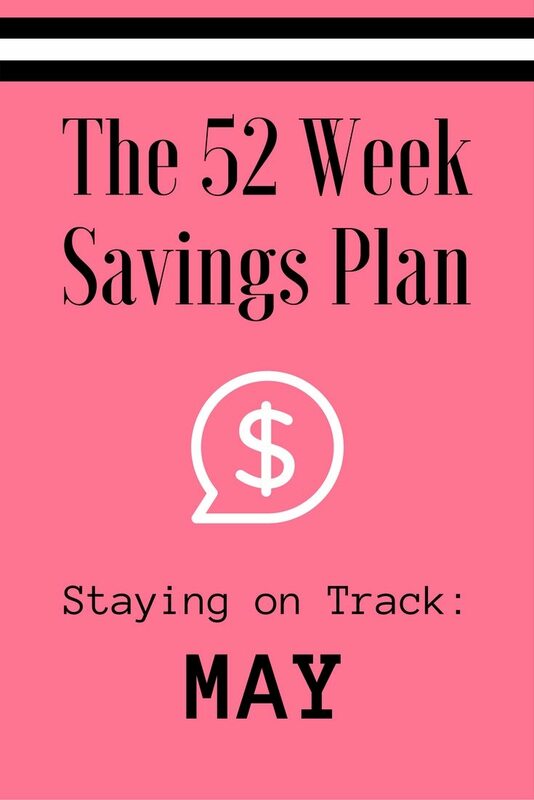 Get my ebook with dozens of tips for success on the 52 Week Savings Plan as well as checklists, including one to help kids learn how to save. Saving money is a daily lifestyle and the key is having a good attitude. Don’t focus on what you can’t do – focus on what you can do and what you can enjoy. Take pride in what you have already saved up and learn from any mistakes. Take each day as it comes and keep saving! Take advantage of May’s deals and start looking forward to a fun summer. Come back next month to see what deals June offers to help you save AND prepare! Sounds like there will be lots of good stuff to watch out this year. Can’t wait to see the post and the tips.